Pluto’s recent geological activity, as observed by NASA’s New Horizons spacecraft, suggests that the small world still has a subsurface liquid ocean beneath its shell of ice. Noah Hammond, a Ph.D. student at Brown University’s Department of Earth, Environmental, and Planetary Sciences, ran a computer thermal evolution model using New Horizons’ data as part of a research team that included Amy Barr of the Planetary Science Institute in Arizona, and Brown University geologist Marc Parmentier. 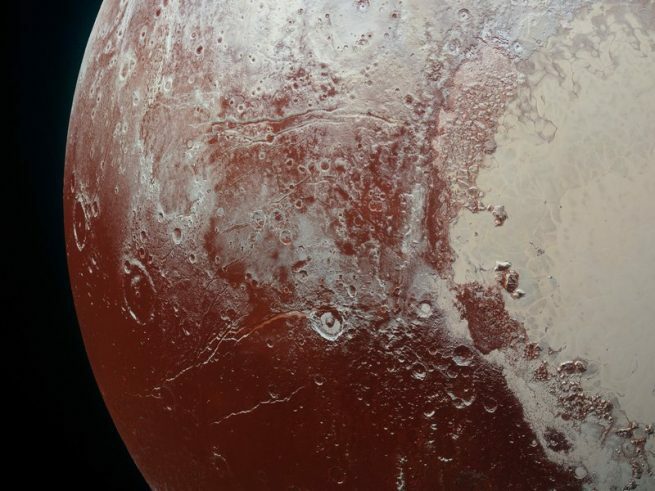 If Pluto once had an internal liquid ocean that subsequently froze millions or billions of years ago, the whole planet would have contracted or shrunk. However, its surface shows no sign of such contraction. On the contrary, the presence of extensional faults, a type of fault that is vertically thin and extends a planet’s crust, indicates a liquid ocean still is present today. That ocean is causing Pluto to expand globally. “Thanks to the incredible data returned by New Horizons, we were able to observe tectonic features on Pluto’s surface, update our thermal evolution model with new data, and infer that Pluto most likely has a subsurface ocean today,” said Hammond, who is lead author of a study on the findings scheduled for publication in the journal Geophysical Research Letters. Data collected by New Horizons revealed the presence of water, nitrogen, and methane ices on Pluto’s surface, which features a variety of exotic terrains including water ice mountains, recently resurfaced plains, and winding faults stretching hundreds of kilometers and running up to four kilometers deep. These faults comprise the tectonic features that led scientists to suspect the presence of a subsurface ocean. Internal heat generated by the decay of radioactive elements in Pluto’s rocky core likely produced the ocean by melting a portion of its icy shell. Due to Pluto’s great distance from the Sun, the ocean has probably been slowly refreezing over time. Because ice is less dense than water, this process is creating the extensional tectonics, causing Pluto to expand. Because density and diameter are crucial for understanding the dynamics of a planet’s interior, the researchers incorporated data on both collected by New Horizons into the computer thermal model. Taking into account Pluto’s low temperatures and high internal pressure, the model determined its subsurface ocean has not completely refrozen. If it had refrozen, its ice would have been converted from ordinary ice to an ice variant known as ice II. The latter is more compact than regular ice and has a smaller volume, meaning it would have caused Pluto to contract globally rather than expand. For ice II to form, Pluto’s ice shell would have to have a minimum thickness of 260 km. According to the latest computer model, its ice shell is approximately 300 km thick, at least partly due to the presence of nitrogen and methane ices. If a planet’s ice shell is thinner than 260 km, an internal ocean could freeze without its ice being converted to ice II, thereby causing no global contraction. While some scientists expected New Horizons to find a dead world with craters and a surface billions of years old, others, including some who attended the 2013 Pluto Science Conference at the Johns Hopkins University Applied Physics Lab (JHUAPL) in Laurel, Maryland, in advance of the flyby, predicted Pluto would harbor a subsurface ocean. The presence of an underground ocean adds Pluto to a growing list of Solar System worlds, including Jupiter’s moon Europa, Saturn’s moon Enceladus, and possibly dwarf planet Ceres, one or more of which could potentially host microbial life. New data sent back by New Horizons indicates that Pluto’s small moon Nix is covered by a layer of water ice, much like fellow small moon Hydra and large moon/binary companion Charon. The data comes from spectral observations taken by the spacecraft’s Linear Etalon Imaging Spectral Array (LEISA) from a distance of 37,000 miles (60,000 km) with a spatial resolution of 2.3 miles (3.7 km) per pixel. This data is helping scientists understand the history of the Pluto system. Nix shows deeper spectral features than Hydra or Charon, a sign that its water ice grains are coarse and pure. Both the depth and shape of water ice absorption are determined by the size and purity of ice grains, with spectral features shallower in grains that are less pure and smaller. Scientists are still uncertain as to why Nix and Hydra, which are similar in size, have different textures of ice grains. They are also puzzled by the fact that Hydra is more reflective in visible wavelengths than Nix, in spite of the fact that Nix has a more icy surface than its companion.